DIY Christmas Ornaments & Felt Stocking Kits! Making your own Christmas ornaments is easier than ever with felt applique kits from Rachel's of Greenfield. Rachel's ornament kits feature creative patterns, quality materials, and clear instructions for all skill levels. You'll find them in the Seasonal & Holiday Kits section of the store! The Gift Bag Felt Ornaments Kit is Rachel's new ornament kit for Christmas 2009. Kit includes wool felt for 6 unique ornaments, embroidery floss for embellishments, and gold string for hanging. Complete patterns and illustrated instructions guide you through the ornament making process. Ornaments are folded and stitched to create an envelope-style pocket, perfect for holding gift cards or other small treats. Attach them to holiday packages as a special bonus gift! Rachel's kit are made with the highest quality standards. Your completed ornaments will provide lasting enjoyment throughout the years. Each ornament is approx. 3" x 4". The Candy Express Felt Christmas Stocking Kit is a new felt applique kit from Bucilla. Kit includes stamped felts, embroidery floss, sequins & beads, needles, and instructions. 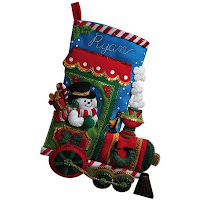 This is a fun stocking design for children with a new or growing fascination for trains. Approx. size is 18" diagonal. Directions for personalization are included. I've found a convenient method for storing the sequins & beads while working on your felt stocking project. I use a small plastic bead organizer with individual sections and snap top closure. I find them more convenient than using paper plates, especially if you need your project to be portable. 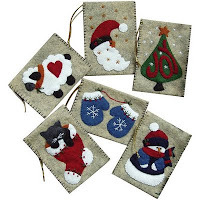 Handmade felt stockings become holiday keepsakes. Visit the Seasonal & Holiday Kits section to see our complete selection of Bucilla felt stocking kits! Weekend Kits offers a creative selection of holiday craft kits. Visit today and be ready for a DIY holiday Weekend at Home! 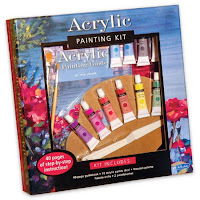 Beginner Painting Kits - Perfect for Gift Giving! We have a new selection of Beginner Painting Kits in the Paint & Draw Art Kits section of the store. 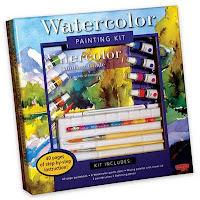 Learn to paint with oils, acrylics, or watercolors with quality art kits from Walter Foster! 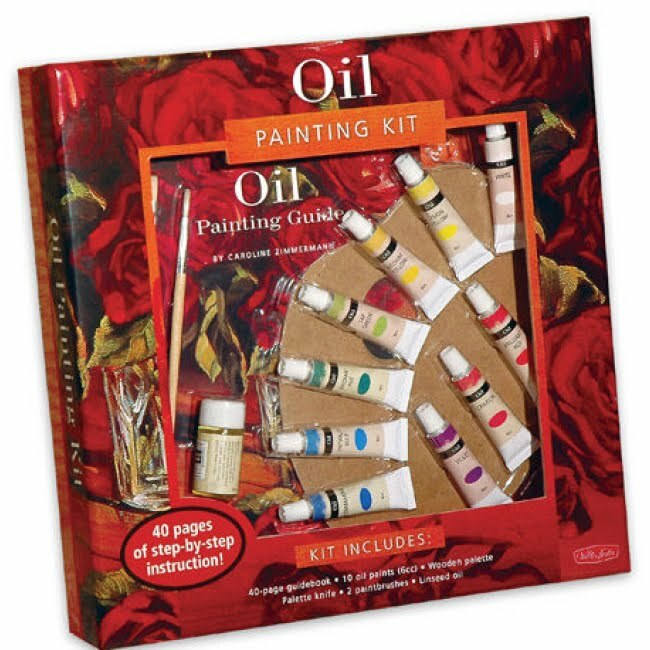 The Oil Painting Kit is a complete art kit for beginners to learn how to paint with oils. 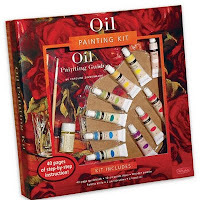 This painting kit contains quality art materials, including oil paints, paintbrushes, wood palette, palette knife, linseed oil, and 40-page guidebook. The guidebook includes comprehensive instruction with detailed illustrations throughout. Beginners start with oil painting basics, including learning about tools and techniques. Project lessons provide step-by-step guidance throughout the painting process. Acrylic painting is a relatively new art medium that uses fast drying paints called acrylics. Being water-based, acrylic paints can be easily thinned and cleaned using water. 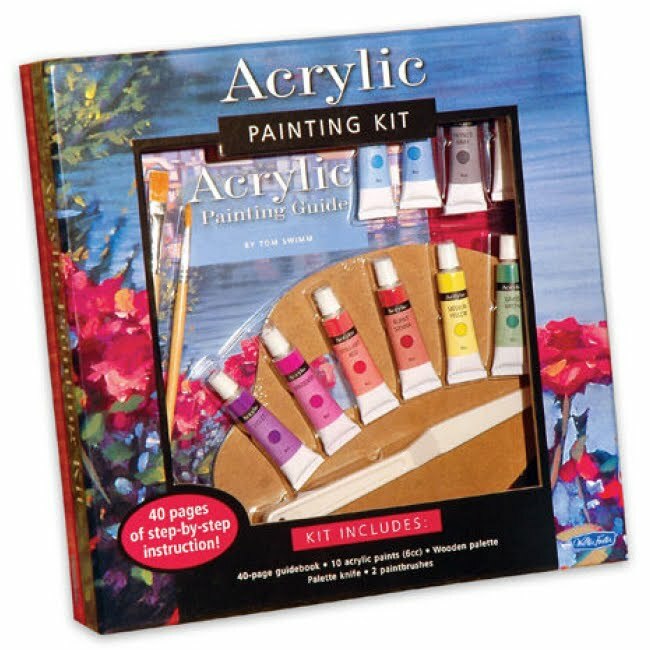 The Acrylic Painting Kit is an excellent starter kit for learning to paint with acrylics. This beginner painting kit includes a 40-page guidebook, 10 acrylic paints, wooden palette, palette knife, and 2 paintbrushes. 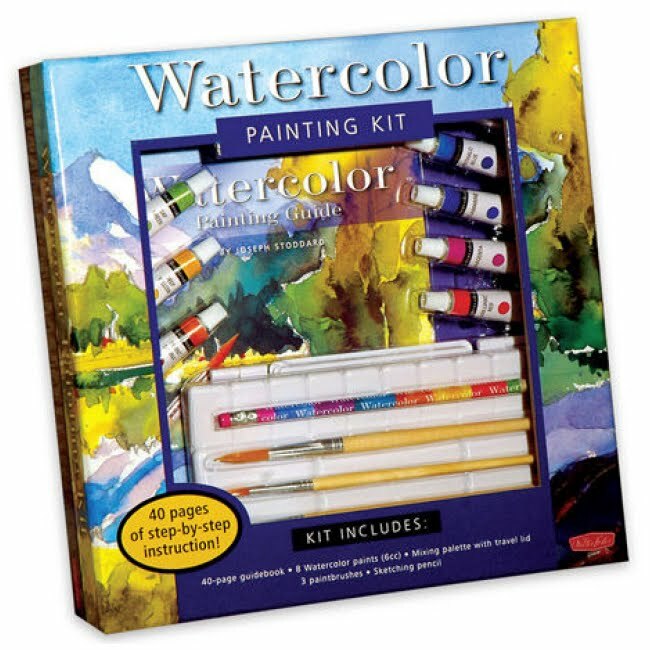 These kits are new releases from Walter Foster, a brand known for quality art products and easy-to-follow art instruction. They include a variety of art projects that can be achieved by following the steps outlined in the guidebook. The kit contents are very nicely packaged in a hardcover case, making this an ideal art kit for gift giving this holiday season! There's also a Watercolor Painting Kit for learning how to paint with watercolors. It includes a 40-page guidebook, a set of watercolor paints, paintbrushes, sketching pencil, and travel palette with lid. You can learn more about Watercolor Painting Techniques by visiting the Walter Foster website. You'll find step-by-step illustrations showing how to paint watercolor washes, special brush techniques, and how to create a variety of effects and textures in your paintings. The Modern Masterpieces Do Art Kit is a Creativity for Kids drawing & painting kit from Faber-Castell. This art activity kit includes watercolor pencils, paint brush, pre-printed canvas boards, foam mounting boards, pencil sharpener, watercolor paper, color-mixing guide, black marker, double-sided tape, hang tabs, and illustrated instructions. Kids are natural artists. 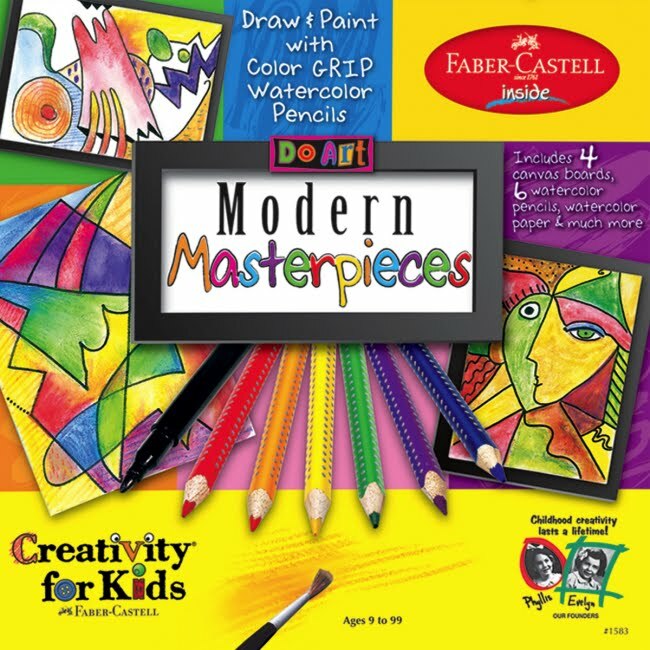 This kit includes all of the art tools and supplies they need to create their own modern masterpieces at home! Recommended for ages 9 and above. Visit the Paint & Draw Art Kits section for details on these kits and to see our complete selection of drawing and painting kits for beginners. Explore a unique selection of creative arts & craft kits at Weekend Kits and be ready to start painting on your next Weekend at Home! Beginner Cross Stitch Kits - Learn a New Craft! You'll find a new selection of counted cross stitch kits in the Embroidery Kits section of the store. Learn-A-Craft Kits from Dimensions were designed with the adult beginner in mind. If you've always wanted to learn how to cross stitch, these beginner counted cross stitch kits make it easy to give it a try. 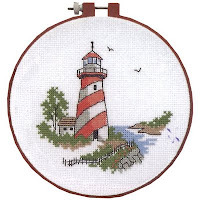 The Lighthouse - Beginner Cross Stitch Kit includes a 6" round plastic hoop, 11-count white Aida fabric, embroidery floss, needle, and instructions. The embroidery hoop is used to hold your fabric taut while stitching. You can also use the hoop to display your finished needleart. This is an ideal starter project for learning cross stitch. You'll need a small pair of scissors for snipping threads. Many stitchers use a floss organizer to separate the floss colors and help keep them from getting tangled together. 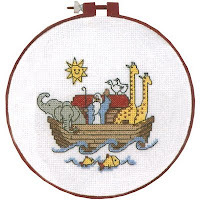 The Noah - Beginner Cross Stitch Kit features a Noah's Ark theme with a smiling sun. Your completed needleart will be perfect for decorating baby's nursery! For a more formal appearance, you could finish with a coordinating mat & frame. Unlike stamped cross stitch, in counted cross stitch, the fabric is not pre-printed with the design. You'll learn to use a color chart to determine where to place your stitches on the fabric. Symbols are used to show the location of each stitch as well as the corresponding thread color. The embroidery floss is comprised of 6 individual strands of cotton thread that will need to be separated prior to use. The instructions provided in the kit will indicate the number of strands needed for stitching. 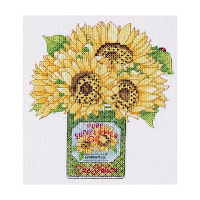 The Sunflowers Mini Counted Cross Stitch Kit from Bucilla is a cheerful cross stitch design adapted from original artwork. This kit includes 14-count white Aida fabric, embroidery floss, needle, chart, and instructions. Mini cross stitch kits are nice starter projects for beginners. The stitched size of this mini design is 5" x 5-1/2". The smaller size also makes this a quick project for experienced cross stitchers with limited free time. Make sure to see our complete selection of cross stitch kits in the Embroidery Kits section of the store. Visit Weekend Kits to explore a variety of kits for beginners and be ready to learn a new craft on your next Weekend at Home!